Stand-up paddleboarding (SUP) is a fun way to get out on the water if you are looking to try something new. It isn't as difficult to master as surfing, but it certainly isn't as easy to get acquainted with as kayaking. Balance and body strength are key to this activity. For those who are more familiar with SUP, it can be fun to bring your dog out for a romp on the board. 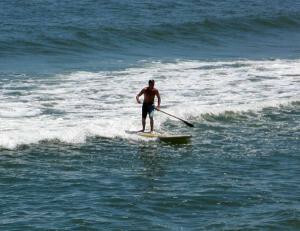 On Cape Cod, there are several places that facilitate SUP. From offering lessons to renting equipment and plenty in-between, there is something for all levels. SUPfari Adventures of Cape Cod has meeting points all throughout Brewster. They offer many different packages, from family fun to kids packages to SUP yoga to excursions and ecotours to simple rentals and more. Check out their website for all the different packages and pricing! Call 508-205-9087 or email for more information. AirSupport of West Dennis (phone number 508-694-7900, email) offers SUP lessons on Bass River, as well as SUP tours and paddleboard rentals. There is a FREE lesson included with each rental and FREE delivery of boards in West Dennis. Adventure Chatham offers SUP rentals and lessons. Call 800-809-1750 or email for more information. Adventure Chatham is located at 1150 Queen Anne Road in East Harwich. Other notable SUP outfitters include Nauset Surf Shop in Orleans, Stand Up and Paddle Cape Cod of Osterville, Cape Cod Paddle Surf, Sea Sports Cape Cod in Hyannis, and Rideaway Kayak in Sandwich. A standup paddleboarder at Lecount Hollow in Wellfleet. Photo by Maggie Kulbokas.